Someone tells you they tried to call you but your phone never rang. Someone tells you they tried to call you and the phone rang on their end, but didn't ring on yours. A call came through but the quality was poor. A call came through but the Caller ID was incorrect. Sharon Telephone Company and Bergen Telephone Company ("Sharon & Bergen") strive to provide excellent customer service at all times. However, people who live in rural areas all around the country are reporting that calls to them are not getting through or are coming through at very low quality. The problem starts with the long distance telephone company or wireless provider used by the person who makes the call, not your local telephone company. The problem can only be resolved by the long distance telephone company or wireless provider of the person who makes the call. The problems occur when the long distance carriers or wireless providers responsible for transporting calls use a process known as "Least Cost Routing" (LCR). LCR is the practice of passing calls in a "hot potato" fashion in order to minimize the cost associated with connecting to the local telephone company of the called party. Essentially, the call is passed from the long distance carrier or wireless provider to another carrier that will transport the call for the lowest bid. However, this second carrier might pass the call to another carrier searching for the lowest cost. Calls may be passed on in this fashion many times. In some cases the calls become looped in the network and are never completed. In other cases, the calls are delivered via a low quality network which results in poor voice quality. Rural areas are more affected by this call-completion epidemic because it is more expensive to serve rural areas. 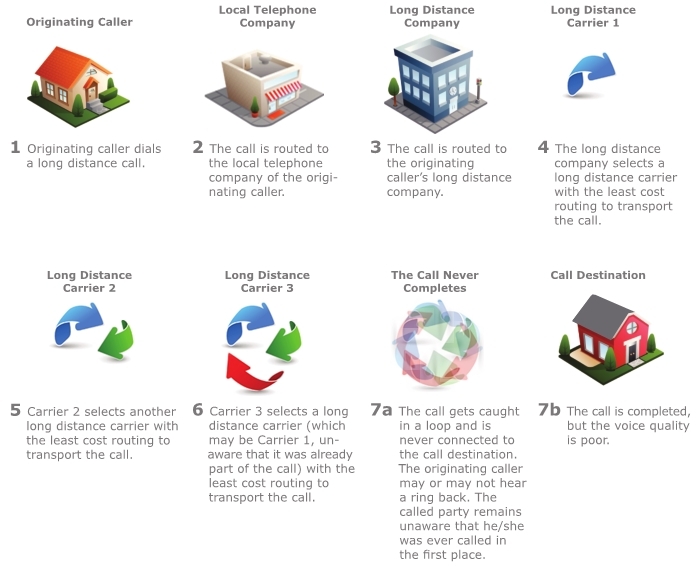 Certain long distance carriers and wireless providers do not want to incur the higher costs to transport long distance calls, so they either refuse to transport calls to some rural phone companies' networks, or they route the calls using LCR to minimize costs. Think of it like a car driving across America taking only back country roads to avoid paying tolls to use the interstate toll-ways. The result will likely be undesirable. Similarly, the call might be very poor quality by the time it has taken all those "back roads." Even worse, the call might not get to you at all. This nationwide epidemic is negatively affecting our rural community, rural businesses, public safety, and our relationship with our customers. In other words, we're just as frustrated as you are! Local telephone companies across the nation have been very active in trying to resolve the Rural Call Completion Problem and LCR by working with long distance carriers and wireless providers, state commissions, national telecommunication organizations, and legislators in Washington DC to get the Federal Communications Commission (FCC) to take action to remedy the growing Rural Call Completion Problem and LCR. The FCC has created a task force to investigate and address the Rural Call Completion Problem and LCR. Rural telephone company advocates are encouraging swift and severe action against all the providers who are the center of the problem. HELP US HELP YOU FIGHT THE RURAL CALL COMPLETION PROBLEM AND LCR! We are hopeful that the FCC will act quickly to address these problems and tighten the restrictions against carriers who utilize LCR. As a company we are fighting this problem, but we need your help. Every voice counts, and our state and national legislators as well as the FCC need to know the magnitude of this problem. Here's what you can do to help: (1) Ask the person trying to call you for the name of their long distance carrier or wireless provider and file an informal complaint with the FCC against their long distance carrier or wireless provider (not Sharon & Bergen); (2) file a complaint with your state legislators in Washington DC; and (3) encourage the person who tried to call you to file an informal complaint with the FCC and a complaint with their state legislators in Washington DC. The date the attempted calls or problem calls were made. If possible, you should identify the long distance telephone company or wireless telephone service provider that serves the caller. You can use the text found here for the body of your complaint; feel free to personalize the text to explain the impact that the Rural Call Completion Problem and LCR has had on you in your daily personal and/or professional life. Complaint to United States Senators: Send a complaint letter to the representative for your area (listed below). For maps of what districts these representatives cover, click on their name. You can use the text found here for the body of your complaint; feel free to personalize the text to explain the impact that the Rural Call Completion Problem and LCR has had on you in your daily personal and/or professional life. Complaint to United States House of Representatives: Send a complaint letter to the representative for your area (listed below). For maps of what districts these representatives cover, click on their name. You can use the text found here for the body of your complaint; feel free to personalize the text to explain the impact that the Rural Call Completion Problem and LCR has had on you in your daily personal and/or professional life. Do LCRs affect every incoming call? - No. Call delivery and quality depends on the call routing practices of the caller's long distance telephone company or wireless provider. Not all long distance carriers and wireless providers use LCR. Does everyone experience this problem? - No. Again, it depends on call routing practices of the caller's long distance telephone company or wireless provider. The problem is growing. In February 2012, the FCC recognized that there was a staggering 2,000 percent increase in the number of call completion complaints between April 2010 and March 2011. See, Establishing Just and Reasonable Rates for Local Exchange Carriers, WC Docket No. 07-135, Declaratory Ruling, at ¶5 (February 6, 2012). Who has responsibility for the call? - The caller's long distance telephone company or wireless provider is responsible to get the call to Sharon & Bergen. The caller's long distance telephone company or wireless provider is the only one that can resolve the Rural Call Completion Problem by stopping the use of LCR. That is why the caller should contact their long distance telephone company or wireless provider to address the problem. Many complainants mistakenly put the blame on rural telephone providers when the problem actually arises from the route the call takes before it gets to the rural telephone provider. What should I do if calls are not being completed? - First, contact Sharon & Bergen to let them know that you are experiencing problems; make sure to provide details. We will not know there is a problem unless you make it known. When calls fail to reach you, Sharon & Bergen will not have any information regarding the long distance telephone company or wireless provider of the person trying to call you. If you know the person whose calls to you are not going through correctly, have them contact their long distance telephone company or wireless provider to make a complaint. Ask them to file an informal complaint with the Federal Communications Commission (FCC) regarding their long distance telephone company or wireless provider and to contact their state legislators in Washington DC. Also, have the person calling you provide you with the identity of their long distance telephone company or wireless provider so that you can file an informal complaint with the FCC, contact your state legislators in Washington D.C., and provide the information to Sharon & Bergen. Sharon & Bergen are more than willing to work with any long distance carrier or wireless provider to resolve this problem, but we have found that hardly any will work with us. If possible, you should identify the long distance carrier or wireless telephone service provider that serves the caller. You can use the text found here for the body of your complaint; feel free to personalize the text to explain the impact that the Rural Call Completion Problem and LCR has had on you in your daily personal and/or professional life. I have filed a complaint but it seems like no action has been taken? - Resolving the Rural Call Completion Problem and the use of LCR has been slow and can be frustrating to our customers and Sharon & Bergen. The FCC recently made some progress. On March 12 one carrier agreed to pay $975,000 and to pay another $1,000,000 in any quarter in the future if this carrier fails to meet call completion benchmarks established by the FCC. While this is a step forward, this is only one of many carriers that are a cause of the call completion problem. That is why it is important that we contact our representatives in Congress to let them know that they need to take this problem seriously and that they can help solve the problem through legislation and pressure on the FCC. Laws with significant fines for long distance carriers and wireless providers that fail to ensure call completion to rural America need to be enacted for this problem to be fixed. Why can't State Commissions do something? - Local telephone companies have met with state commissions regarding this problem. The state commissions are well aware of the situation but are limited in their authority to act. This is a FCC issue, and this is why it is very important that you and the caller trying to reach you file informal complaints with the FCC online or via telephone.